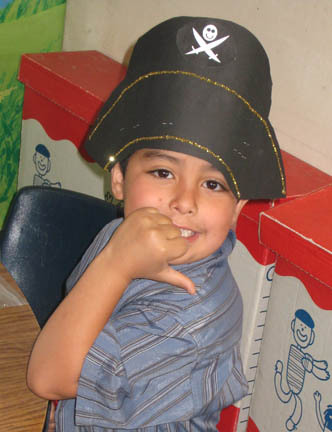 For our last day of school, last year we had our very first Pirate Day! It really was a blast- simply the very best last day of school I have ever had in all of the years that I have been teaching! I have been waiting to blog about it so that it would be closer to the end of the school year for most of you. If you have been following my blog this year, you will notice that the pictures of the children are a bit unfamiliar. That’s because they are pictures of my students from last year! Hopefully, it will not already be too late for you to use these ideas, but if so, then maybe you can file the ones you like away for next year and go enjoy your summer! Below are the activities that we did for our Pirate Day. We did each one during our small group rotation. I had no trouble getting lots of volunteers to come and help out on that day, given that it was a special “party type” of day. I also asked for donations of plastic gold coins so that we could give them out as prizes and rewards on that day. I came up with this pattern for a pirate hat after a few tries last year when I had a student teacher. The children enjoyed putting glitter on their hats and swinging their fists with a hearty “Ar!” while they were wearing them! I am including the pattern as a free download for you this week as well. Enjoy! I decided that the children should have the experience of following a map and then digging for buried treasure, so I decided to try to draw a diagram of our playground and use it as a map. Then I made a copy for each group of kids, and put a red X on the spot where their treasure would be buried. I buried their treasure in plastic ziplock baggies with their names on them all together in one spot according to the map. BUT... first I tore the map into about four or five pieces, and the children had to then reconstruct it (like a puzzle) and tape it back together. Then, once reconstructed, they had to follow the map and dig for their treasure. It was quite exciting! 3. Buccaneer Bang: A Pirate CVC Game! This game was definitely the highlight of our Pirate Day! It plays much the same way as many of the other Bang games that I have designed, but the children earn plastic gold coins in this game! It is lots of fun and is now for sale on my website on the same page as the other games that I have made. For our special day, we also made little treasure chests by gluing popsicle sticks onto clean, dry milk cartons that were decorated with jewels and other plastic bling. It certainly added an element of fun and excitement to the game! There are, of course, blank cards at the end of the game so that you can add in your own words. 1. Duplicate the cards. Cut apart and mix up. Put one Pirate “Ar” card on the bottom of the deck. There are blank cards at the end if you need to change the word cards. 2. The dealer gives each child a card in turn. The child attempts to read the word. If he does not know it, there is no penalty. * Parrot- The child says, “Polly wants a cracker!” and gets a piece of cereal or a plastic gold coin if you prefer. 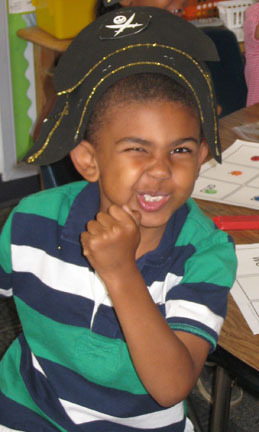 * Pirate with eye patch- The child covers up one eye and tries to read a word on one of the teacher’s cards. * Anchor- You’re sunk! The child has to sit on the floor until his or her next turn. * Walk the plank- The child climbs up on his or her chair and jumps off, and then pretends to swim around the table. For extra fun, the child to his left can pretend to be a shark and chase him around the table! * Peg leg- The child jumps around in a circle on one leg. * Gold- The child gets two gold coins. * Treasure Chest- The child gets three gold coins. 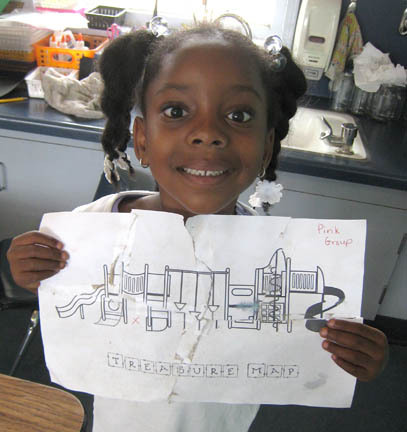 * Treasure Map- When a child receives both the left and right sides of the map, then he gets one piece of gold. The child with the most cards at the end of the game is the first winner, and the child with the most gold coins is the second winner. 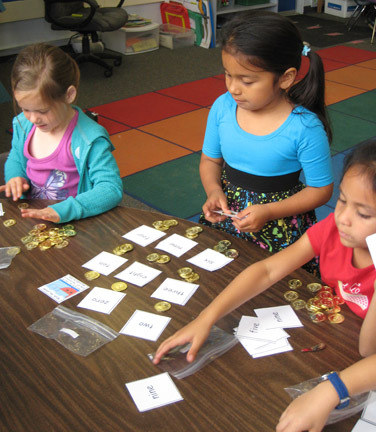 We also played bingo, such as CVC bingo and Sound Deletion Bingo and used those same gold coins as rewards. We may also throw in a round of Sounds Fun Bang , too, just for fun, since this year, my kids seem to think that this game is the equivalent of being in Vegas!. We will definitely also be singing the Pirate Ar! song from the Sounds Fun Phonics CD, too, since we LOVE that song! At the end of the day, we had a pizza party for lunch, and then had some prize redemption tables so that the kids could trade in their gold coins for some prizes, such as candies, old books and donated used toys, etc. We also usually give them all a chance to go out and blow some bubbles outside, if there is time. They were also allowed to keep their coins, if they wished, instead of trading them in for prizes. The parent volunteers in my class are always so wonderful, that I rarely have to do much, other than plan and prepare for the day! As long as I am ready, they will take care of everything, and I just manage the group, direct traffic, and enjoy. I love my students and their parents! They are the best! This comes at a perfect time for me. /ar/ is our focus soon! I just bought my eye patches today. Thanks for the pirate hat template. Heidi, this is grrrreaat!! I'm doing pirates as my last theme of the year. We have 19 days left. We make up our own pirate names, creat our own pirate flags, draw our own treasure maps. The kids learn that there really were pirates, and yes, they weren't very nice people at all, even tho they are fascinating. The hat pattern is wonderful! Thanks for sharing! Wow! What great ideas, I don't know how you do it all! 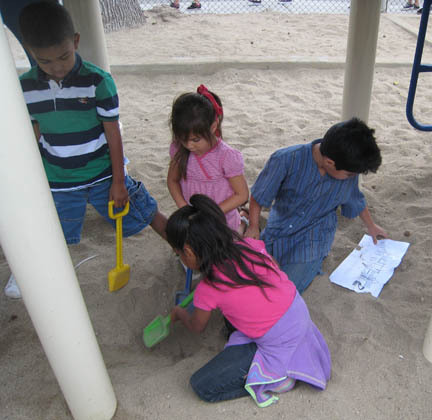 You certainly covered all your bases with the buried treasure and fun games and prizes- what a blast! Oh my goodness...you are wonderful! I just was thinking it would be a good time of year to get excited again and have a Pirate theme! There you go again! Thanks Heidi...for your creativity and generosity! Thank you so much for sharing such fun activities. The children are blessed to have you as their teacher. Hi, so is this included in your complete order set too? Everything in the resources page? In the month of September (19th I think) there is a day called "Talk like a pirate day". 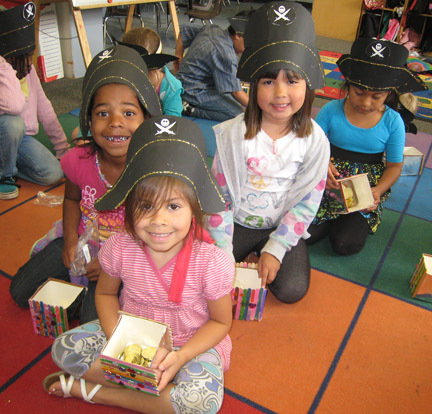 Our kindergarten classes all participate with fun games (all educational), great books, and adventure and we all dress like pirates that day. Even the parent volunteers join in. It has become an annual tradition that leaves kids saying..."This is the best day ever!"